Is the tooth fairy actually good for kids? Your child loved the tooth fairy when he was in first grade, but should you keep the tradition going now that he is in third grade? Experts reveal their thoughts on keeping the tooth fairy tradition alive for kids and tweens. Much like Santa Claus and the Easter Bunny, the tooth fairy is one of those fun traditions that make childhood so magical. Many parents remember the joy of sneaking into their child’s room and slipping money under the pillow after their child lost their first tooth, and second and third — and so on! About the time that your child starts asking if Santa Claus is real, they may also start to have their doubts about the mysterious tooth fairy. This is all part of normal development, says psychotherapist and parent coach Patti Ashley. Even when your child is developmentally ready to know that the tooth fairy isn’t real, media psychiatrist and bestselling author Dr. Carole Lieberman says it is soothing for kids to keep the tradition going. “Parents should never stop the tooth fairy tradition — even once your child gets old enough, sophisticated enough or cynical enough to stop believing in fairies,” says Dr. Lieberman. What do you do once the gig is up? “Once your child says, ‘I don’t believe in tooth fairies anymore,’ just smile and leave something under his pillow, anyway,” she says. My child is actually scared of the tooth fairy! Should you change the tradition for older kids? Oops! The tooth fairy forgot to come! 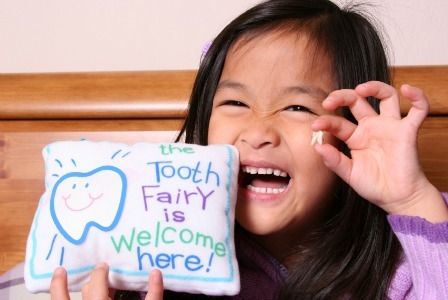 It’s happened to all of us tooth fairies — we get busted in the act doing the under-the-pillow swap or forget to play the tooth fairy altogether. What should you do if you want to keep the tradition going? Did the tooth fairy forget to come one night leaving your child upset? “The tooth fairy had a busy night. We’ll try again the next night,” says Dr. Lasky. For some families, older kids might like reversing the roles and helping out the tooth fairy for siblings, especially for teens who have finished losing their teeth. “In my house, the tooth fairy leaves money for lost teeth up until the child figures out that the tooth fairy isn’t real,” says parenting expert and DaddyScrubs.com founder Robert “Daddy” Nickell. When will my child lose baby teeth?